A record 605,000 square metres of exhibition area was needed to accommodate the 3423 exhibitors at this year’s edition of the popular German show. UK contributor Steven Vale joined the 580,000-odd visitors to sample the atmosphere and provide a round-up of the larger machine highlights from the Munich Fairgrounds. 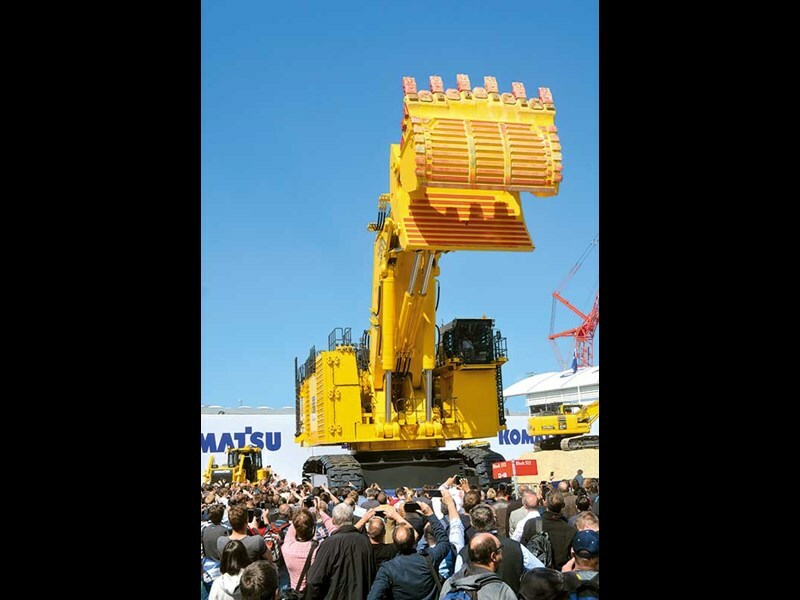 The opportunity to watch Komatsu’s PC7000-6 fire up its two 50-litre engines and hoist and open its 36m3 clam shovel thrilled the crowds. 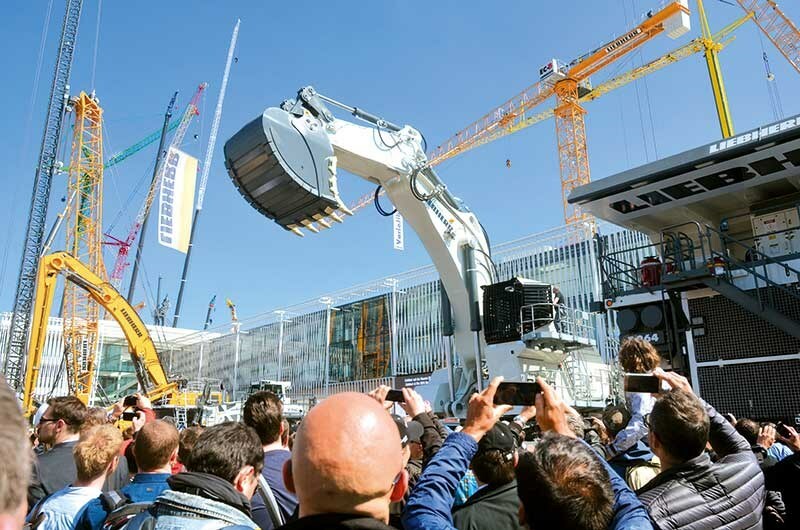 The largest excavator ever brought to Munich, the two power packs produce a maximum output of 3350hp (2500kW), and in ideal conditions the 700-tonner can shift over 5000tph. The Bauma machine is the fourth PC7000 built in Dusseldorf. Configured as a 34m3 backhoe, excavator number one was shipped to North America. The second works at a South Australian coal mine, while the components to machine number three, and the first electric face shovel, are destined for North America, which is quite possibly where the Bauma excavator will end up. Competing in the important 200-tonne class sector, Liebherr’s R 9200 is designed to go head-to-head with Komatsu’s PC2000, Hitachi’s EX1900 and Cat’s 6020B. Within the Liebherr stable, the R 9200 plugs the gap between the R 9150 and R 9250. Available in a range of backhoe bucket sizes from 10 to 15.5m3, the 9200 is matched to load 100- to 140-tonne class trucks. In backhoe configuration, the R 9200 weighs 205 tonnes, and we understand a 210-tonne face shovel is coming, as is an electric version. 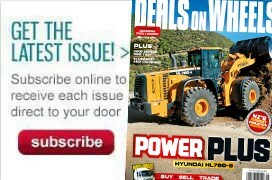 The diesel-powered machines take their power from a 12cyl Cummins QSK38 (1086hp). 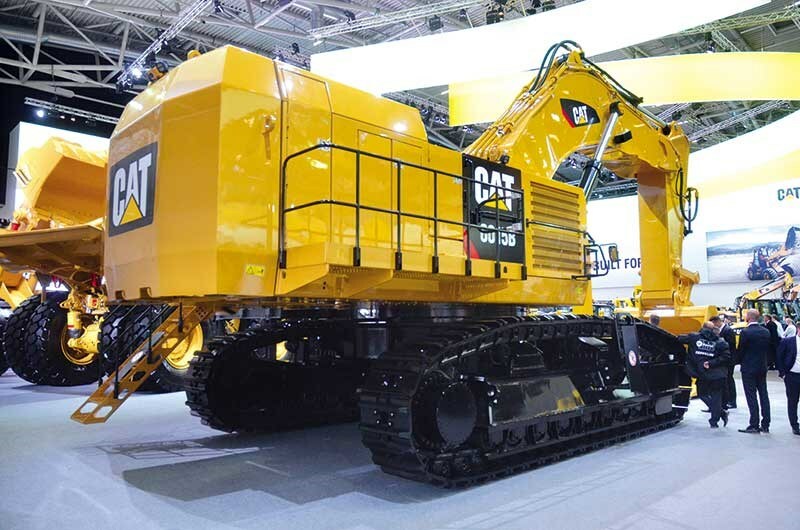 Bauma provided European visitors with the first opportunity to see Cat’s 140-tonne successor to the popular 5110B. Called the 6015B, and the smallest ‘mining’ excavator built in Dortmund, Germany, Cat has cunningly retained the 5010B’s former exterior looks. On the interior, many of the components come directly from other Cat machines. The track links are from a D11 dozer, some of the main valves from a 390 excavator, parts of the undercarriage from a wheeled loader, and the 12cyl C27 (813hp) engine is the same as that used in the 775 truck. The 6015B wields an 8.1m3 bucket (was 7.6m3 on the 5110B). 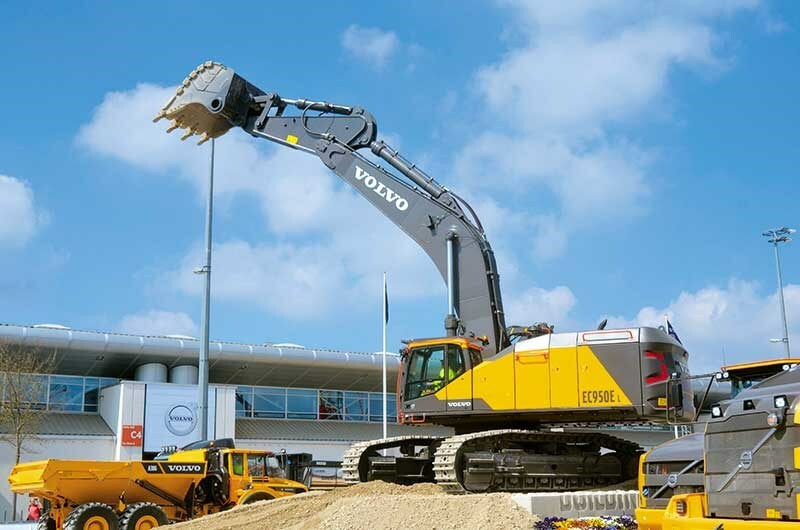 New on Volvo’s stand were the EC750E and EC950E, the latter of which is the largest excavator ever built by the Swedish company. 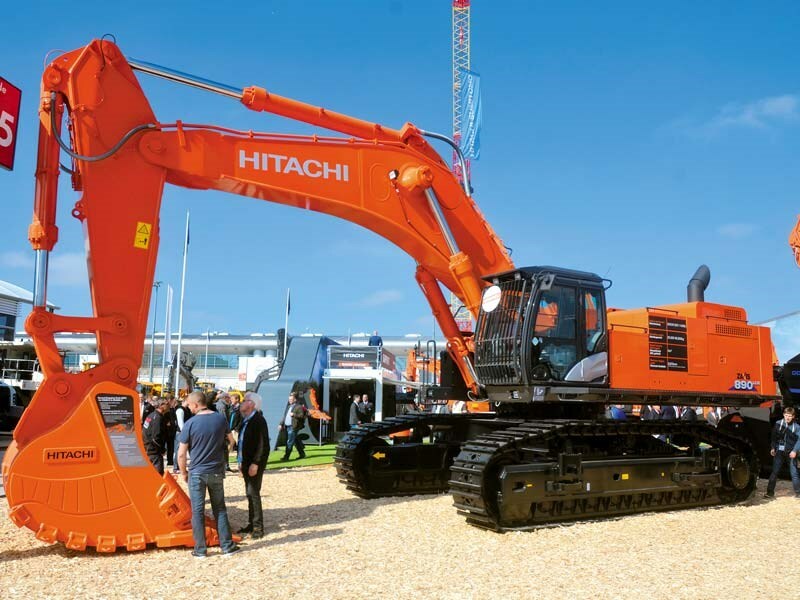 Conceived and built in Korea, the new excavator flagship is currently only available with a Stage II (606hp) engine, which restricts it to non-emissions compliant markets. Boom options include lengths of 7.25m and 8.4m, and there are two sticks – 2.95m and 3.7m. Hitachi showed the Stage IV version of its popular ZX870-5. Now called the ZX890LCR-6, the inclusion of an Ad Blue tank is not the only update because additional safety rails and anti-slip plates have been added to the top of the structure to improve safety. Also the standard bucket size has increased from 4.8 to 5m3. Check out these pics from this year’s Matamata Truck & Machinery Festival.